Though surrounded by Burgundy’s great vineyards, I also have a favourite from the Loire Valley. Taste it and discover its vineyards on a campervan holiday. Pouilly Fumé comes from the eastern edge of the Loire Valley on the opposite bank to it’s even more renowned cousin, Sancerre. The vintage pictured above comes from the vineyards of Sébastien Treuillet, a former cereal grower turned winemaker – I really like the intense, dry, citrus flavour. Henri Bourgeois is another excellent producer, but come to think of it, I don’t ever remember finding a bad producer of Pouilly Fumé – the strict appellation rules just don’t allow it! 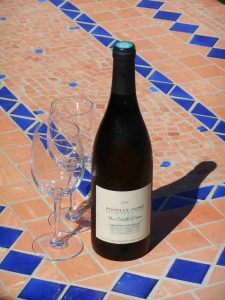 Learn more about this delicious Loire Valley wine and find a list of other producers on the Pouilly Fumé A.O.C. official website. As this wine region is really pretty, and just an hour and 40 minutes from our depot, it makes a great starting point for exploring the Loire Valley by campervan. You can even spend the night in your campervan – free of charge – on a wine maker’s land or at a cheese producer’s farm. Read more about the Loire Valley wines and download their road maps here. ← Get ready for next year’s Tour de France!